[SatNews] OHB Systems AG, In a special ceremony held on Monday, February 3, 2014, and in the presence of the German federal government’s new coordinator for aviation and space, Ms. Brigitte Zypries, the core module of the ExoMars Trace Gas Orbiter, comprising the structure, the thermal system and the drive system, was handed over to Thales Alenia Space by OHB System AG. From left to right: Brigitte Zypries, Constitutional Secretary of State (SPD), German aviation and space coordinator, Prof. Dr.-Ing. Johann-Dietrich Wörner - Chairman of the Executive Board of the German Aerospace Center (DLR), Jens Böhrnsen, President of the Senate and Mayor of the Free Hanseatic City of Bremen and Marco R. Fuchs, Chairman of the Excecutive board of OHB AG. 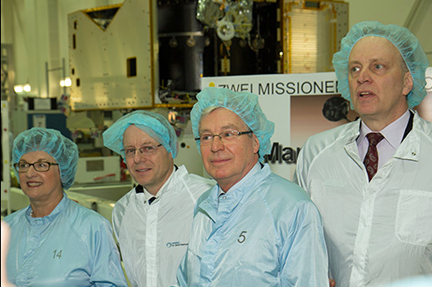 The new parliamentary state secretary Brigitte Zypries made a point of experiencing live the completion of this milestone in the ExoMars program. “This was a very pleasant start to my new position as aviation and space coordinator. With the ExoMars program, the German space industry is demonstrating its outstanding skills,” she said after the core module was handed over. ExoMars is a joint project of ESA and the Russian space organization Roscosmos and is comprised of two missions that will be heading for Mars in 2016 and 2018 to find answers to the important question as to whether life ever existed on that planet. To this end, it will be taking soil samples from the planet’s surface and analyzing them. The ExoMars program covers the key entry, descent, landing, drilling and exploration technologies. The purpose of the TGO is to find proof of methane or other atmospheric gases which indicate the existence of biological or geological processes on Mars. The TGO has several tasks in the two missions. In the 2018 mission it will be communicating with both the fixed Russian ground station and the European rover. Today’s release at the OHB head office marks the end of an intensive construction and testing phase during which the core of the orbiter was prepared as the basis for integrating the TGO subsystems and units, which also contain scientific instruments. ESA Director General Jean-Jacques Dordain also took part in the ceremony meeting with representatives of the ExoMars industrial syndicate to acknowledge this important milestone. “ExoMars is an ambitious and fascinating project. It is a premiere for Europe and, in many aspects, also a premiere for the entire world. Thanks to the skills of our industrial partners here in Germany, we are able to complete the transfer of this important element for the 2016 mission on schedule. We are eagerly looking forward to the key scientific findings which the TGO will obtain for us in order to understand the evolution of Mars and to find an answer to the question as to whether life has ever existed there,” said Jean-Jacques Dordain. As a part of the European industrial syndicate, OHB System AG is responsible for developing the core module of the Trace Gas Orbiter, which comprises the structure as well as the thermal and propulsion system for the 2016 mission, and will be supplying this for the principal contractor Thales Alena Space. The Trace Gas Orbiter and the “Schiaparelli” landing module will be launched in January 2016 and should reach Mars nine months later. The second mission with the ESA Rover and the Russian ground station is scheduled for May 2018 and will reach the planet at the beginning of 2019. Roscosmos is ESA’s most important partner on the ExoMars mission.